Welcome to Finca Verde Lodge, Bijagua A family run Eco-tourism project. 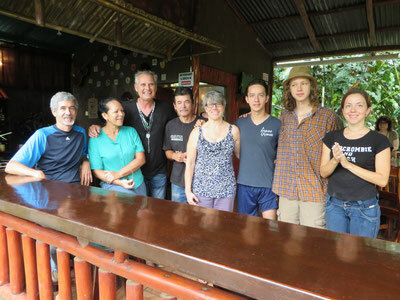 We are a small scale family run eco-tourism project set on an organic farm, located in the northern rainforests of Costa Rica. Over the past 20 years we have converted our land into an eco-paradise, producing ornamental and medicinal plants organically, as well as vegetables, fruits and herbs among other produce. The farm also has a butterfly garden and laboratory, we reproduce rare butterflies and frogs and release them back into their natural habitats. Our aim is to create a sustainable and viable approach to organic farming, which safe guards and promotes nature in its natural and most healthy form. We promote zero chemical use as a needed alternative and seek to continually develop our land and project responsibly. Through our work we have created a haven for birds and animals including hummingbirds & toucans, sloths, frogs, lizards, butterflies and snakes. In short we have a beautiful thriving tropical farm and nature resort nestled into the valley of two volcanoes in the rain forest. In our agroecological farm we understand the dynamics of our local environment, produce some of our food and other products we need by maximizing the use of available natural resources. Our farm is not just a chemical free viable alternative for the future but necessary one for our community.